Linda Burton posting from Little Rock, Arkansas – “It was my favorite job,” my father said of being a dairy farmer. He pursued that career path for only three of his ninety-three years, but the memory of that kinship with cows stayed in his mind as he sat behind a desk doing accountant things for most of his life. Those three years on a dairy farm imprinted me as well; I was a pig-tailed second grader when I began Life on the Farm; my father’s right-hand helper, or so he said. Today is his birthday (Craig Sherer Burton, 1918-2011); thinking about him seemed to stir up memories of cows, and the deliciousness of an absolutely fresh dipper of milk. 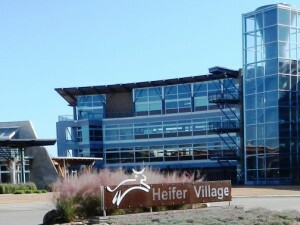 It put the notion in my head to visit Heifer International, which I’d planned to do anyway; it’s an organization I’ve contributed to for years, and I knew that International Headquarters are here in Little Rock, just past the Clinton Center. It’s a beautiful setting at the edge of the Arkansas River, the building is a LEED Certified Green building; airy, light, and pleasant. 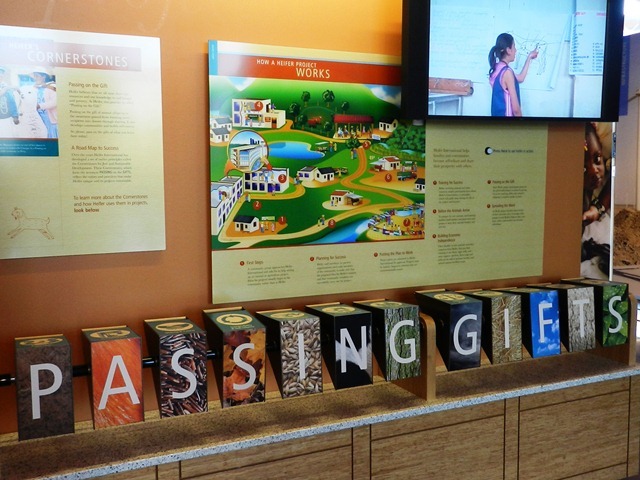 I was greeted by colorful characters on storyposts and a live volunteer who gave me an overview of what I’d see – the timeline for the work of Heifer International; a map showing projects going on around the world; and the Cornerstones of the organization – spelled out in 12 descriptive blocks as “PASSING GIFTS.” The mission of Heifer International is to end hunger. 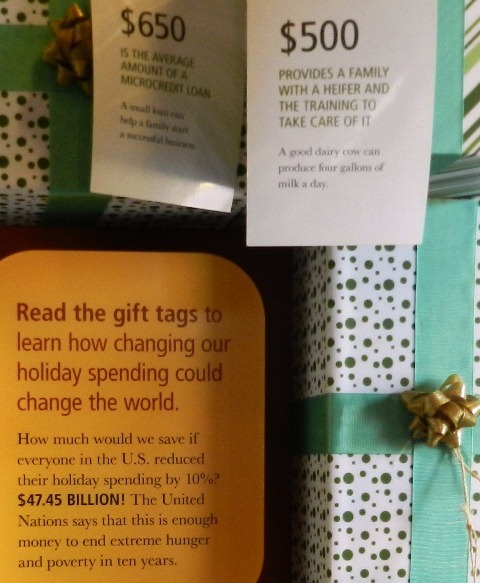 And it started with a simple idea from an Indiana farmer: Don’t give a cup of milk to someone in need. Give a cow. That Indiana farmer was Dan West, doing volunteer work among orphans and refugees of the Spanish Civil War; he got the notion that if these families had their own cows they would not have to depend on temporary aid. By 1944, West and his neighbors donated and distributed the first cows throughout Europe and Heifer International was born. All these years later, the mission has expanded to 30 types of animals that are distributed in countries around the world– goats, geese, bees, silkworms, water buffalo, sheep, llamas, and chickens, to name a few; they provide not only food, but a chance to earn an income. “Give people a hand-up, not a hand-out,” is the guiding principle; that empowers people to turn hunger and poverty into hope and prosperity. Although West’s vision came from his Christian faith, Heifer works with people of all beliefs, or no belief; no faith statement is made or required; most of the staff that works for Heifer is indigenous to the country of the project. 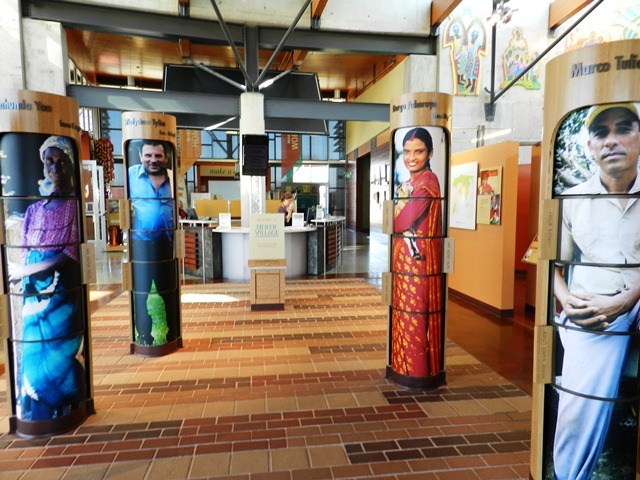 The commitment is simply to “help hungry and poor people” by bringing a community together. The animals don’t just provide a reliable source of food, but also a reliable source of income. Extra agricultural products, such as milk from cows or goats, honey from bees or eggs from chickens, can be both shared within the community and sold at market. This new income, coupled with the training in sustainable practices, allows people to clothe their families, provides them with medical care and sends their children to school. When a family has a cow, every morning there’s a glass of rich milk for the children to drink before heading off to school. Class fees are paid with the income from the sale of milk, and there’s even enough to share with the neighbors. Better still, every gift multiplies, as the animal’s first offspring is passed on to another family who also agrees to pass on an animal, and so on. And because a healthy cow can produce a calf every year, every gift will be passed on and eventually help an entire community move from poverty to self reliance. Since 1944, Heifer has helped more than 13 million families in more than 125 countries move toward greater self-reliance through the gifts of livestock and training. We’re in that gift-giving time of year right now, and I consider that a gift worth giving; you don’t even need a box or a bow. Just go to the website, read about the opportunities available through Heifer International, and give a cow! PASSING GIFTS. The twelve cornerstones. P. Passing on the gift. Every family who receives an animal agrees to pass on one or more of their animals offspring to another family in need. A. Accountability. Groups define their own needs, set goals, and plan appropriate strategies; Heifer provides guidelines, screens recipients, and monitors progress. S. Sharing and Caring. Heifer believes all global problems can be solved if people are committed to sharing what they have and caring about others. S. Sustainability and Self-reliance. 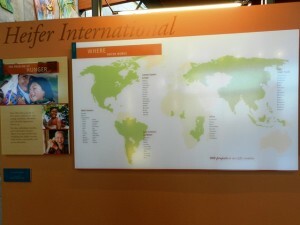 Heifer funds projects for a limited time, so project groups must plan for the project’s continuity. I. Improved Animal Management. Feed, water, shelter, reproductive efficiency, and health care are essential ingredients in successful livestock management. The species and breed must be appropriate for the area. N. Nutrition and Income. Livestock contribute to human nutrition by providing high quality protein, draft power for crops and transportation, and manure for soil fertility. G. Gender and Family Focus. Heifer’s gender program encourages women and men to share in decision-making, ownership of animals, labor, and benefits, thus strengthening the family. G. Genuine Need and Justice. Families are eligible who truly need an opportunity and can benefit from modest support, regardless of creed or ethnic heritage. I. Improving the Environment. Heifer livestock should improve the environment by having a positive impact on such things as soil erosion or fertility, sanitation, forestation, biodiversity, or pollution. F. Full Participation. Members of the group “own” the project and the groups have control over all key decisions. T. Training and Education. Local people are involved as trainers. Formal training and informal farm visits include training in livestock husbandry, food processing, marketing, and human nutrition. S. Spirituality. Spirituality is expressed in values, beliefs about the meaning of life, a sense of connection to the Earth, and a shared vision of the future.